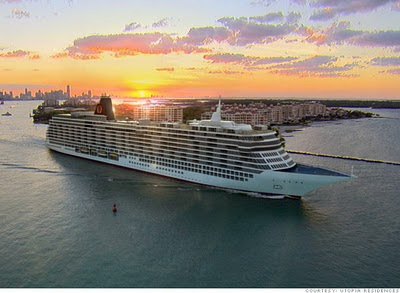 From Money/CNN: New Mexico-based investors have teamed with Korea's Samsung Heavy Industries to build The Utopia, (above, as it would look in Miami) an opulent $1.1 billion ocean liner that will travel the globe, hopping between the world's major sporting and cultural events. The 105,000-ton and 1,000-foot long ship -- the weight and length of more than three Lady Liberty statues, from the base of the concrete platform to the top of the torch -- is scheduled for completion in 2013. As their website says: "Travel the world in the comfort of your own home." Yes, please, ME WANT. Can you imagine living on this ship. Constantly on the move but all of your stuff right there with you? Of course, I'd prefer the 40,000 ft home! After all, you wouldn't want to get island fever by feeling all cooped up. Even a six-month stay as a hotel guest would be nice. But I'd rather just have my permanent home on board this non-permanent nomadic city. 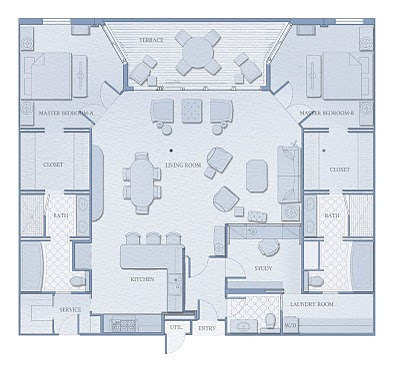 Remember you can click on photos to enlarge......especially the floor plan below. Utopia will have 15 decks, 200 private residence units and 204 hotel rooms. 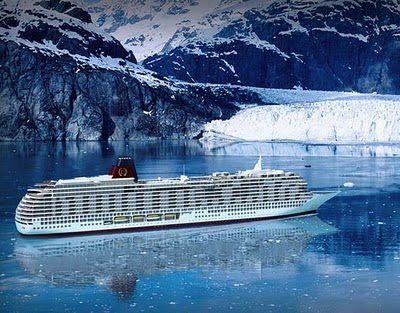 That makes the ship spacious enough to accommodate 3,000 guests, said chairman of Utopia Residences David Robb, but to turn up the luxe, Utopia will only welcome 600 guests aboard at a time. Plus 600 crew members to serve them. The cost of most residences on the Utopia will range from $3.8 million for a 1,400-square-foot condo to $24 million for a 6,600-square feet estate. 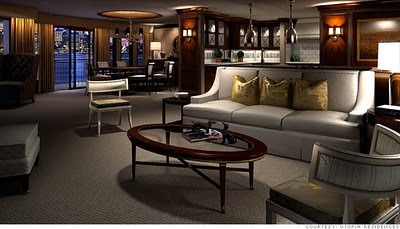 The single 40,000-square-foot unit will be priced at $160 million. The lairs go on sale in 2010. Located on Decks 8-15, Utopia’s 190 luxury residences are well-situated to offer breathtaking views wherever your home will travel. Each residential deck has been carefully designed to offer maximum comfort and convenience, with service areas for our professional chefs and caterers and additional storage space all just steps away from your door. 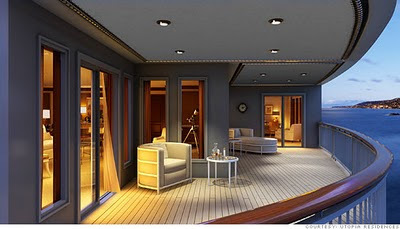 Residents will also have access to six private elevators shuttling to and from the residential decks. Wow! 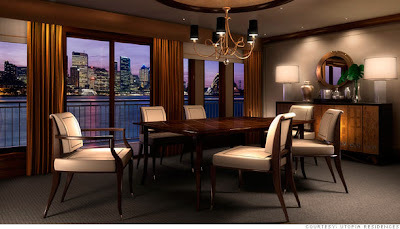 This is one of my greatest dream in life, to have a condo in a cruise. Wow! This must be exciting and I can have this kind of leisure only in my dreams. I am wondering if this kind of cruise plus condo for sale is still available. How I wish I can travel the world and ride on that prestigious cruise ship.